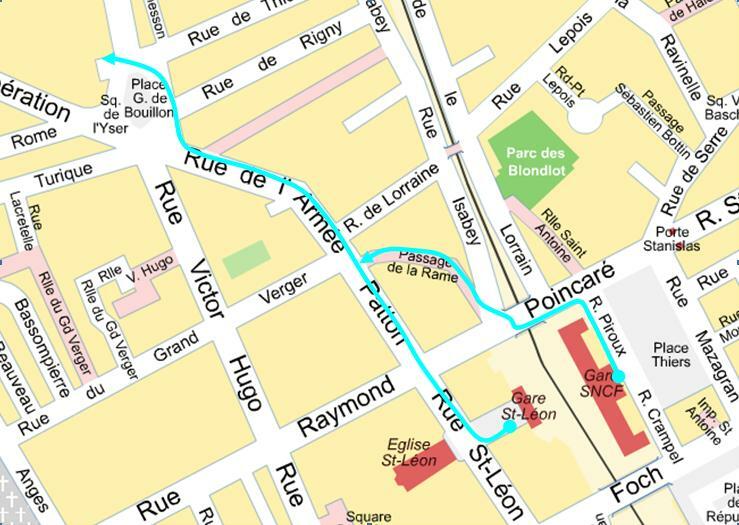 How to get to Nancy 2 Arts and Humanities CampusGetting to the campus on foot from the railway station: The Université de Nancy 2 Arts and Humanities Faculty Campus (Campus Lettres Sciences Humaines) is fairly centrally situated in the city. It is a short walk (700 m/less than half a mile) from the main train station, whether you exit the station on the Place Thiers side or the rue Saint-Léon side. For a street map of Nancy (Via Michelin website), click here. Getting to Nancy by train: Nancy is on the French high-speed rail (320 kmph/200 mph) network and is consequently only an hour and a half away from Paris by high-speed TGV, as compared to around 3 hours 50 minutes by car. There is approximately one train in either direction every hour from early morning to 8 pm. Tickets bought well in advance can cost as little as 40€ for the return journey Paris-Nancy. For more details and for details of other rail access to Nancy, click here (French Railways site in English). It is also possible to catch a TGV directly from Terminus 2 of Charles-de-Gaulle airport in Paris, to a station 20 minutes north of Nancy by motorway called Gare Lorraine TGV, although timetable choice is limited (one or two trains per day). Shuttle coaches leaving approximatively once an hour carry passengers from the Gare Lorraine to Nancy in 35 minutes. One-way shuttle tickets cost around 4.20€. For a timetable (information in French) click here. Getting to Nancy by car: Nancy is accessible by motorway and journeys to it by car are generally fast and simple, although the A 31 motorway to the north of the city can sometimes snarl up with heavy traffic at rush hours. Please note that although the motorway sections immediately around Nancy are free of charge, large sections of French motorways are toll roads. On the positive side, such sections are generally impeccably maintained and often have relatively light traffic, but this comes at a cost. Below are some examples of approximate (motorway) journey times to Nancy from other French and European cities, with toll charges where applicable. French motorway speed limits vary depending on the section, between 130 kmph (80 mph) and 110 kmph (70 mph) in general to 90 kmph (55 mph) on for example city transit sections. Speed cameras are increasingly common. Getting to Nancy by air: Nancy does not have a commercial airport. There is a small regional airport 42 km (26 miles) called Aéroport Metz-Nancy-Lorraine to the north of the city, accessible by (mostly) motorway, but the airport’s direct flight offer is limited (link to airport website).Luxemburg Airport: The closest international airport is over the border in Luxemburg. There is no rail link directly to the airport but after transit to Luxemburg railway station by taxi, one of many regular and rapid trains to Nancy can be taken (15 direct trains per day, taking between 1’30” and 1’45”). Timetables available here (information in French). In good traffic conditions, Luxemburg Airport is an easy 1’20” drive by motorway from Nancy—but at rush hour the A 31 tends to saturate, in particular around the France-Luxemburg border. Paris (Roissy) Charles-de-Gaulle Airport: There are around two direct high-speed trains per day running directly between Terminal 2 of France’s biggest airport and Gare Lorraine TGV station twenty-five minutes north of Nancy by motorway (coach shuttle to Nancy). See above (‘Getting to Nancy by train’) for more details. The journey takes around an hour and a half. The comfort of taking a train directly from the airport, avoiding transit through central Paris, might offset the disadvantage of the potentially long wait engendered by the infrequency of these direct TGVs, and the fact that you do not arrive directly in Nancy—something to look into, and for which your flight time would of course be a factor. Alternatively, it is of course possible to take light rail (‘RER’) from Paris-Roissy CDG Airport to central Paris, taking RER line B, arriving at the railway station Gare du Nord, and then either making theshort journey on foot (5-10 minutes) from Gare du Nord to Gare de l’Est (train lines out east from Paris and so to Nancy), or taking the metro (line 5, direction Place d’Italie) between the two stations (only one stop via metro). The RER trip from the airport to Gare du Nord takes about half an hour. Parisian public transport (RATP) information is available in English here. Frankfurt Airport (Germany): Nancy is in the north-eastern corner of France and is only a relatively short drive from the German border (about 1’20”), and so not so very far from neighbouring Germany’s biggest airport in Frankfurt (about 3 to 4 hours’ drive depending on traffic conditions). Like Paris CDG, Frankfurt Airport has a high-speed train station within it, but connections to Nancy are fairly poor resulting in rail journey times of 4-6 hours (connections from Frankfurt’s main railway station are not better). Frankfurt might be an option nonetheless if you can find a particularly good flight offsetting other considerations, and/or if you are intending to hire a car for the duration of your stay (Europcar, for example, would hire out a basic model from Frankfurt from Wednesday 22nd June to Monday 27th June for around 260 euros). Where to stay: If you are looking for absolute convenience in terms of location, the All Seasons Nancy Centre Gare hotel is only 500 yards away from the railway station and only the same distance from the Arts and Humanities Campus, and offers rooms from 55 euros per night including breakfast. This is a two-star hotel, with an 87% TripAdvisor satisfaction rate at the time of writing. Another possibility along the same lines—handily located and reasonably priced, but perhaps not particularly picturesque—is the Hotel Akena/Hotel Revotel at 41-43 rue Raymond Poincaré, even closer to the campus, with rooms available from 48 euros per night including breakfast. Should you wish to stay somewhere with a little more charm, the most pleasant parts of central Nancy are the mediaeval and Renaissance old town, and the 18th century Place Stanislas-Place de la Carrière neoclassical ensemble. Nancy is a relatively compact city so these areas are not so very far away from the Arts and Humanities Campus either: around a 20-25 minute walk (3/4 of a mile to just under a mile). The Hôtel de Guise is set in the old town and was originally a seigneurial house built in 1752 for the Countess de Bressey. It offers rooms from 63 euros per night (plus 9 euros for breakfast).For those willing to go a little more upmarket to make the stay in Nancy a pleasure in itself, the 2011 edition of the much-respected restaurant and hotel guide Gault et Millau recommends the following hotels (Gault et Millau use a grading of one to five “keys”, in which 1=standard, 2=good, 3=superior, 4=prestige and 5=exceptional): Hôtel de Haussonville, 4 Gault et Millau “keys”. A beautiful Renaissance private home and protected work of architecture in the warmest heart of the old town, without being on the noisiest streets of old town nightlife. Individualised themed decoration in some rooms. From 140 euros per night. About 20 minutes’ walk (less than a mile) from the Arts and Humanities Campus. Best Western Hôtel Crystal, 3 Gault et Millau “keys”. Quiet hotel in the centre of town (not in the old town but close by, and in an attractive part of the beating heart of the city in terms of shopping etc), 5 minutes from the station and 5 minutes from Place Stanislas, air-conditioning, free wi-fi. Rooms from 80 euros. About 15 minutes’ walk from the Arts and Humanities Campus. Hôtel des Prélats, 3 Gault et Millau “keys”. Again not in the old town but an attractively renovated 17th century building close to tram lines but away from significant traffic next to Nancy’s 18thcentury classical architecture cathedral. Rooms from 84 euros. About 20 minutes’ (less than a mile) walk from the Arts and Humanities Campus, and the tram line can take you half the distance.